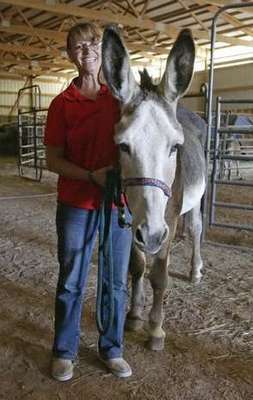 Holyland Donkey Haven is a 100% volunteer operated, nonprofit donkey rescue and sanctuary located in Mt. Calvary, WI. Holyland takes in unwanted, abused, and neglected donkeys. ​At Holyland, our mission is to educate all people, adults and children alike, on the proper care and maintenance of these wonderful and loving animals. We are a no-kill shelter, unless medical reasons dictate that humane euthanasia is the kindest alternative. Donkeys are surrendered when their owners can no longer care for them. The reasons for surrender include: moving, sickness, neglect abuse, death of caretaker or the are simply no longer wanted. All donkeys cared for by Holyland are screened for illness, have been assessed for the skills they may have, and are given adequate time to acclimate to their new environment before they join the large herd. All donkeys are taught or refreshed on the basic skills needed to keep them in optimal health, including: lifting their hooves for the farrier, leading and trailering. ​When deemed ready, Donkeys are adopted to loving forever homes. Depending on the circumstances, some of the Donkeys become permanent residents of the Holyland sanctuary, made possible by generous donations and public support.